Nebia: La regadera del futuro, inventada por un mexicano – Blog de Grupo SSC S.A. de C.V.
El empresario mexicano Carlos Gómez Andonaegui, junto con Philip Winter y Gabriel Parisi-Amon, han creado la regadera del futuro y se llama Nebia. Esta regadera utiliza un moderno sistema que permite ahorrar hasta un 70% de agua. Todo empezó en el 2010, cuando Carlos Gómez era el director de Sport City y quiso crear un sistema que le ayudara a ahorrar agua en los baños, ya que en este tipo de clubs, al día se bañan muchísimos musculosos en las regaderas y utilizan miles de litros de agua. 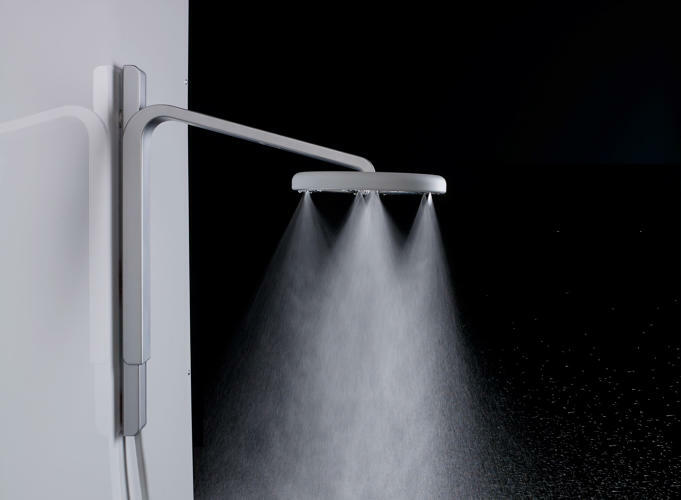 Si bien la sensación de bañarte en Nebia es muy distinta que la de cualquier regadera común, varios de los que han podido probarla dicen que se siente increíble; que en un instante estás completamente empapado, como si estuvieras en una nube muy concentrada pero sin sentir la presión. El uso de shampoo y jabón funciona normalmente, como en cualquier regadera. ¡Gracias Carlos por no olvidarte de nosotros los pobres que también queremos ahorrar agua! That’s why they are launching a totally new shower head called Nebia, which keeps you warmer and gets the conditioner out of your hair all while using 70% less water! According to their Kickstarter page , a typical household of four can save twenty-one thousand gallons of water per year which translates into a $397 reduction in in water and heating bills. They seem to be on to something big – as I’m writing, their Kickstarter campaign has raised nearly $1.4 million towards a goal of $100,000 with 28 days to go! For a fascinating look at this new shower head, check out the write up in Innovation by Design. A toilet discharge valve is optimized to reduce household water consumption and maintain performance. This acclaimed new fan design was advanced by fluid flow simulation. Bill is the Lead Product Marketing Manager for Fluids at ANSYS and has over 25 years of experience marketing complex software products across the globe . He would love to hear from you how CFD simulation is making your products better!